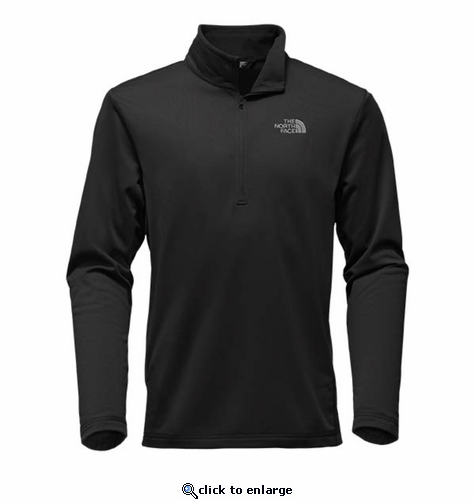 Our classic Tech Glacier \xBC Zip in smooth-face fleece provides lightweight, low-bulk warmth to keep you comfortable all year round. Named for the coldest, most unforgiving side of a mountain. But The North Face legend begins, ironically, on a beach. More precisely, San Francisco's North Beach neighborhood, at an altitude of only 150 feet above sea level. It was here in 1966 that two hiking enthusiasts resolved to follow their passions and founded a small mountaineering retail store. From the beginning, the brand committed to serving all those who desired to explore and to serving our natural wild lands by helping to conserve them. At their core, they believe exploration creates an indelible bond with the outdoors, inspiring people to protect our land and pass these beliefs down to the next generation. Soon thereafter, that little shop became known as The North Face, a retailer of high-performance climbing and backpacking equipment. In 1968, The North Face moved to the other side of San Francisco Bay, to the unbridled possibilities of the Berkeley area, and began designing and manufacturing its own brand of technical mountaineering apparel and equipment. Through the 1960s, The North Face brand cherished a following amongst avid outdoor athletes and began sponsoring expeditions to some of the most far-flung, still largely untouched corners of the globe. This launched a proud tradition which continues in full force today and constantly reinforces The North Face mantra, Never Stop Exploring. By the early 1980s, The North Face was taking exploration to the outer limits of the ski world, adding extreme skiwear to the product offering. These were the days of pastels, neons, hair dye, and mohawks; they laid the groundwork for today's free-spirited snowsports athletes. By the end of the decade, The North Face became the only supplier in the United States to offer a comprehensive collection of high-performance outerwear, skiwear, sleeping bags, packs and tents. The 1990s ushered in an era during which The North Face further broadened the outdoor world it helps athletes to explore. The decade saw our debut in the sportswear market with the launch of Tekware, an innovative collection designed to provide rock climbers, backpackers, hikers, trail runners, and outdoor enthusiasts with the ultimate fit and function. The North Face half dome logo began to appear with greater regularity on ultramarathon courses, high-country trails, and big walls. And, as the calendar clicked toward a new millennium, The North Face launched its own line of trekking and trail-running shoes to ultimately address the head-to-toe needs of those always striving for the next horizon. While the brand continued to shape the outdoor market through product, expedition and athlete achievements, it launched two game changing product lines - Thermoball and Fuseform. Thermoball introduced synthetic insulation mimicking the capability of down. Fuseform revolutionized the manufacturing space as it changed the way technical apparel is produced. Now, more than 50 years after its humble grand opening, The North Face delivers an extensive line of performance apparel, equipment, and footwear. We push the boundaries of innovation so that you can push the boundaries of exploration. We remain deeply proud to be the first choice of the world's most accomplished climbers, mountaineers, extreme skiers, snowboarders, endurance runners, and explorers. There's little telling what the next 50 years hold for us. However, there is one bedrock of certainty: The North Face will maintain an unwavering commitment to pushing the limits of innovation and design, so that you can push your limits outdoors. Never Stop Exploring.